Well! This past June 8, I celebrated a birthday by touring Mt Vernon and leading my mom on a perhaps ill-advised adventure to the Bake Shop at Clarendon for macaroons (fittingly, they had Birthday Cake flavor). Ill-advised because our GPS satellites konked out on the return journey, leaving a woman from Wisconsin and a woman unfamiliar with driving in D.C. to navigate our way back to the hotel. I began to suspect some force didn’t want me to leave the Washington metro area. But, whatever that force intended, I have in fact returned to Wisconsin–after a somewhat leisurely journey through Virginia and southern Ohio, with frequent stops to see tourist sites my mother and I have passed by on more purposeful trips over the past 18 months. The theme was, unintentionally, presidential deathbeds (Washington, Jefferson, and Madison all passing away peacefully at their homes at Mt Vernon, Monticello, and Montpelier, plus a stop at Ford’s Theater in D.C.). We also got to explore Mound City, Serpent Mound, and the Adena Mansion (which upon reflection is I think the source of the name of the early Adena moundbuilding culture) around Chillicoethe, Ohio. I’ve been back in Wisconsin for about just over 3 days now. This house is much more peacefully quiet than the apartment in D.C.–although I miss my desk, as handling a laptop charging cord while contorted on the living room couch is a different sort of experience. Well, a desk and a bookshelf are all that is lacking to convert the spare room into an Official Writer/Editor office. 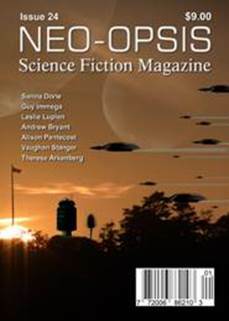 Speaking of writing/editing: I’ve had a new publication in Issue #24 of Neo-Opsis magazine. “Sibial’ in Exile” is a story about loss, grief, and, well, exile. It’s tempting to consider whether it reflects on the twinges of D.C.-homesickness I’ve been experiencing on occasion this past week (a little weird, given I’ve just done a literal homecoming), but honestly? I think it’s glummer than that. Sibial’ was drafted as someone I loved was dying, which I think is key to understanding it. Not all science fiction is a metaphor. But sometimes science fictional events are parallels to real life ones. Anyway, besides being in some very strange was autobiographical (but then, I suppose every story is, if we’ll use the term so liberally) “Sibial’ in Exile” is also the opening of a wider range–not precisely a series, but a number of stories sharing this background. I have a few more of those stories on my to-write list for the summer. Also on my to-write list are a series of blog posts about writing and editing, including a master list of writing resources that couldn’t quite fit into the Starter Guide for Professional Writers. Then come the book reviews, thanks to rich windfalls from both LibraryThing and Goodreads giveaways. An ARC of Half a King is my first introduction to Joe Abercrombie, and while I feared he’d be grimdark along the lines of George R.R. Martin or even Richard K. Morgan, his characterization is actually very…well, not lighthearted, but with an essential underlying compassion that is very refreshing and extremely engaging. I’ll be checking out more by him for sure.